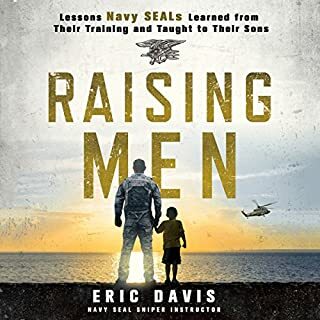 Would you listen to Raising Men again? Why? Absolutely. It was entertaining and sniper focused. I will be a better father because of this book. Great food for thought and I was amazed at how many times I burst out laughing. Similarly, my father wasn't in the picture and I could relate to what Eric was saying. This book gives solid perspective on how to be a great father. In fact, after reading the first chapter and when I got home from work, I noticed I was already becoming a better dad. Eric of course. I love how he, his wife, his ex wife and her husband are all on the same team when raising the kids. I appreciate the humor, the tell it like it is attitude and the sniper shot right between the eyes perspective when calling me out on my priorities and raising my boys. This is my first time listening to Peter. I didn't think I'd like the voice at the beginning, but he is right on the money. Great job. Very funny. Surprised at how many times I burst out laughing. Great job Eric. The ripple affects of this book will be seen by generations.